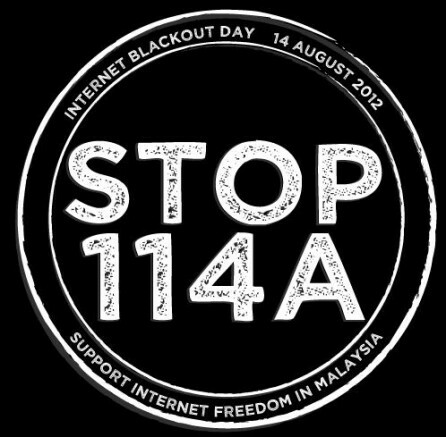 After much hype over the enactment of the section within the act, we saw the entire Malaysian internet space buzzing on promoting to stop the use of this act, as it creates a "blanket" solution to identifying internet creeps that goes around the internet maliciously and more importantly, anonymously as we have seen happen many occasions in this blog as well. So, a day after the internet blackout conducted here, I am more interested in the follow up question. What do we learn from all this? As this issue is such a sensitive issue, I've observed that a lot of people out there are, once again, shouting and screaming in support of this campaign. A lot that comes out with very emotional arguments and understanding and once again some have failed to assess both side of the situation on this matter. So, I believe I should take this opportunity to do so. As a law graduate I do see the general flaw in the enforcement in this law which is the vague nature on how it defines the scope of those at fault over malicious and defamatory comments or contents online. On part of the presumption of fact, this would mean that even before investigation, the person affected will be assumed "guilty" and the burden of proving otherwise now lies to the person accused. In general even the youngest law student would know that this goes against the very basic principle of law which is the "presumption of innocence", Ei incumbit probatio qui dicit, non qui negat. Every single aspect in law base their common understanding within this principle on the sole basis that it wold negate any possibility of a "floodgate" of accusations and punishments, which is what you don't want in the law. In short, the law should not be a "shoot now, question later" scenario. It does create a very uncertain and scary scenario to a lot of us here and I believe that it is because of that the act itself was greeted in a very negative way by the internet users. In the end of the day we don't want to deal with a regulatory law that we either can't control, define or in some cases understand on how to implement it properly. Problem is, what if we need such an act? 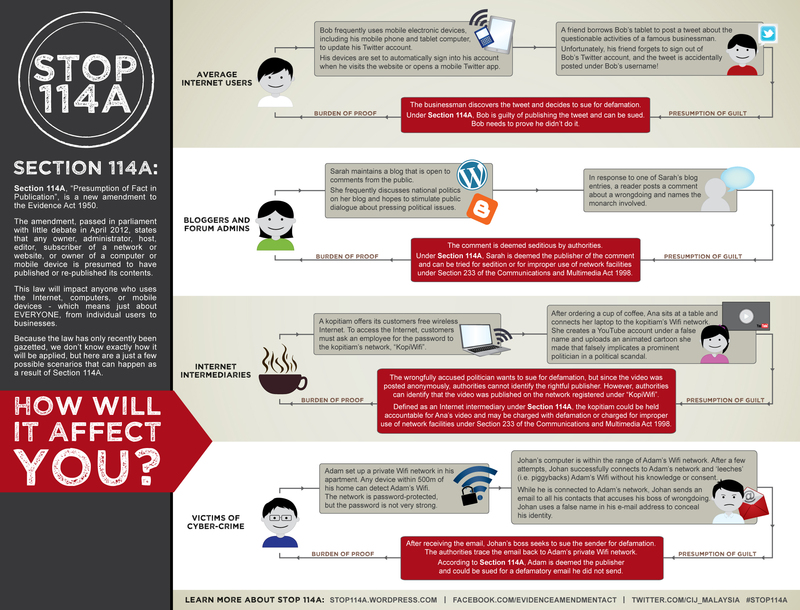 Not the current 114A act but rather something to punish ACTUAL internet trolls/cyber bullies/anonymous cowards? 1 are those that use it responsibly, much like you and me. 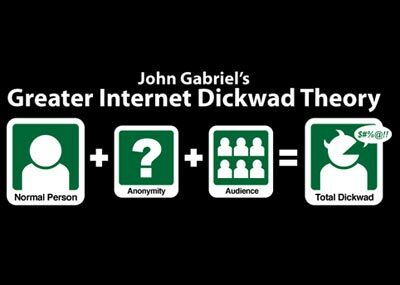 The other are those who hides behind that "anonymous curtain" and maliciously harm others from their right of using the internet, simply because they know they can get away with it. The problem that we have with internet users in Malaysia is that cyber law has very limited powers in punishing those in that second category. Time and time again we have seen cases where people get bullied online and they get away with it. So many times we have seen our blogs, forums or even social media pages get bombarded by idiots who don't really know what is going on but would want to jump in the bandwagon because they want to get the attention to themselves. There are also times we have seen those that target a person online because they collectively feel that they have the right to do so. As much as I am against the enactment of Section 114A as how it is, I am also against those that think they can get away from being an anonymous cyber bully and there should be a law that we can rely on in punishing these people in full glory. What I feel that they should do is to amend that law better to make the implementation of such enforcement more effective against total "douchebags" online that make our lives online a living hell. I honestly believe as we speak, there are those that would be skimming this article and post anonymous comments from selected areas of this articles. I do agree with you. 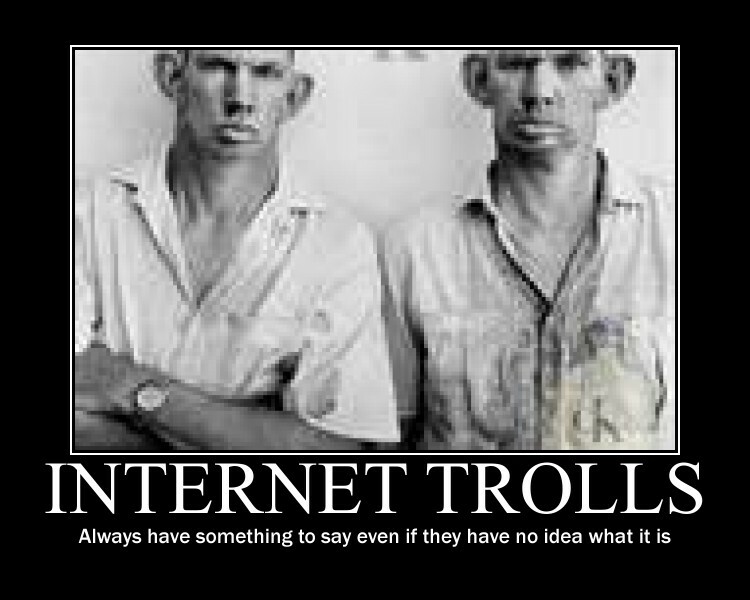 We need a law that would punish the real trolls and cyber bullies. I didn't do my research but did any other country manage to have an effective law against them? If yes, I would be even more disappointed. Also, I highly suspect that they would be using such law for their own benefits, attacking politicians and such with this because they themselves are cowards hiding behind this flawed law.